Oxford American Southern Music CDs. 12 CDs. Arkansas Educator Licensure, 1968-1970, 1984, 7 cu. ft.
Arkansas Forestry Commission records, 44 cu. ft. The Arkansas Burger Company, a popular restaurant located in Little Rock, opened its doors in 2000. Faulkner County native Dan Spencer owned and operated the restaurant until 2017 when he retired at age 78. Spencer graduated from Arkansas Teacher’s College, now University of Central Arkansas, in 1962 and became youth director at the Little Rock Boys and Girls Club for five years. He married Jeanne Spencer in 1968 and moved to Dallas, where he was an administrator at University of Texas Southwestern Medical School for 25 years. The couple returned to Little Rock in 1994. Spencer aspired to open a hamburger restaurant for many years, researching the topic thoroughly before opening Arkansas Burger Company in 2000. Spencer found a building located on 7410 Cantrell Road, Little Rock, to remodel into the restaurant. During the remodeling, Spencer spent off-days searching local thrift stores and flea markets for Arkansas-related memorabilia to display on the walls of the restaurant. This eclectic mix of posters and art now comprises the Arkansas Burger Company Collection. This collection contains mostly visual materials that adorned the walls of Arkansas Burger Company, many of which are posters, photographs and promotional materials of sports or tourist attractions throughout Arkansas. 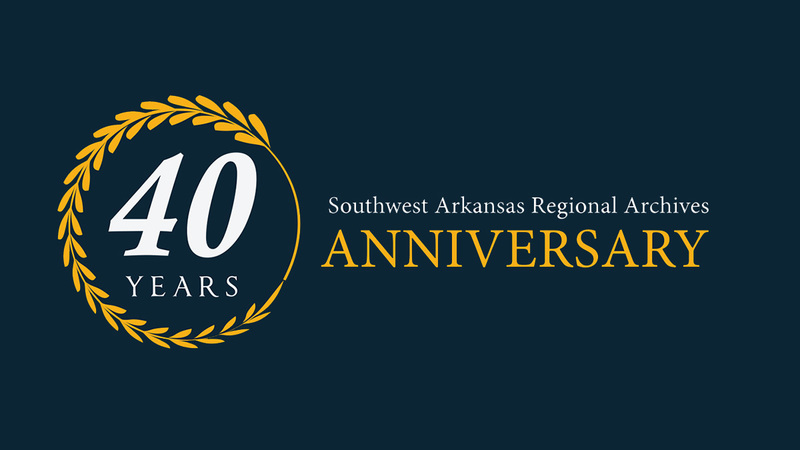 The Southwest Arkansas Regional Archives (SARA), a branch of the Arkansas State Archives (ASA), will celebrate its 40th anniversary on Saturday, March 3 at SARA, 201 AR-195, Washington. Speakers at the celebration will include Department of Arkansas Heritage Director Stacy Hurst, SARA Foundation President Gary Walker and Keenan Williams of the Hempstead County Historical Society. The Arkansas State Archives will be closed on Monday, February 19, in observance of President's Day. Approximately 179,000 African Americans served in the Union Army during the Civil War, making up ten percent of the total army, yet little documentation of their service exists. This muster roll gives a history of the 46th Regiment of the United States Colored Infantry, Company D, and lists all of the soldiers who made up its ranks. The unit, made up of African Americans from Helena, Arkansas, was formed in 1863 as the 1st Regiment Arkansas Infantry (African Descent) and later renamed the 46th Regiment. This regiment was one of the first African American regiments formed in the Mississippi Delta. The unit spent much of 1863 in Louisiana before moving to Mississippi and then to Memphis. After the war, the unit was stationed in southern Texas, where it guarded the United States/Mexico border, preventing Confederates from avoiding surrender by fleeing into Mexico. The unit was disbanded in 1866. This collection holds one 1865 muster roll for the Forty-Sixth Regiment of the United States Colored Infantry, Company D.